Amazon Subscribe & Save Answers:- Amazon’s Today quiz is here. 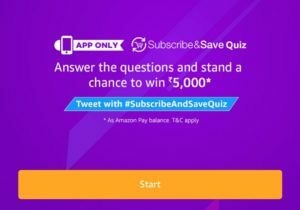 Amazon Subscribe & Save Quiz Can Give You Rs.5000 for Answering simple 5 questions like other quizzes this quiz is also app only.We have added answers also please check answers below. How to win Rs.5000 from amazon ? 2. Open the app and you will see a banner about the contest. Click on it. 1. You can set up regularly scheduled deliveries and earn savings on your daily essentials. This Amazon.in offering is called ‘Subscribe & ____’. Fill in the blanks. 2. Which of the following products cannot be subscribed on Amazon? 3. Which of the following is not a benefit in Subscribe & Save? 4. What is Subscribe & Save’s curated, monthly subscription box called? 5. What is the current Fest running on Subscribe & Save, which gives you minimum 25% off subscriptions called?